Intel is getting serious about optics and they have brought Corning in to make the infrastructure happen. As with everything else, the silicon part of photonics is only part of the problem and one that could not happen without the other pieces. With any large change there is usually a big bang item that gets a lot of headlines but lots and lots of smaller advances back it up. Without one the other would be impressive but not practical. The Silicon lasers and photonics that Intel is developing are not very useful without cables, connectors, and support infrastructure to be used with it. Being able to transmit 25Gbps does not do very much without something to transmit it over, like say a standard cable. That is where Corning comes in to the picture with the new ClearCurve LX fiber and MXC connectors. Both are a pretty big step over the current MTP fibers that debuted in 1987 and as you would guess both take the 25+ years of tech advancements in to account. 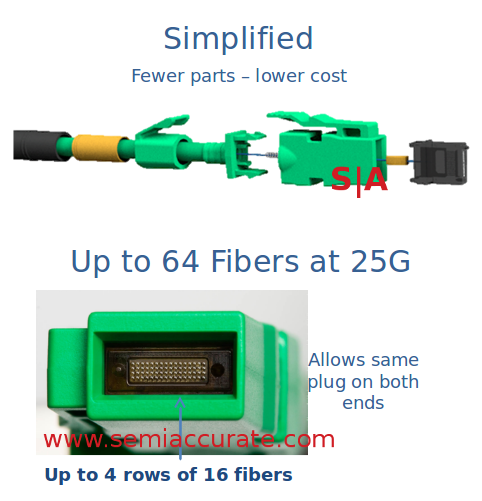 The result is a multimode fiber capable of 25Gbps over 300m, scalable to 1.6Tbps, and a 64 lane connector. It looks like this. One big problem with multimode fibers is chromatic dispersion and without going into the physics of why this happens, just be aware that different frequencies of light move across a medium at slightly different speeds. For single mode fibers one can tune to achieve the desired results, for multimode things get much trickier. MTP is optimized for around 850nm wavelengths, the newer ClearCurve is aimed at 1310nm but since it is multimode it has to handle much wider ranges as well. Corning claims to have solved the chromatic dispersion problem but the details were not available yet, the best we could get was careful doping of the fiber. Since the fiber is capable of 1.6Tb over 300m it looks like the solution works. The connector itself is a pretty massive step forward as well starting with 64 lanes vs the 24 on MTP. MTP also had bare fiber to fiber connections that were only 50 microns wide. Tolerances are tight and tolerance stacking problems meant that you had to be pretty darned precise to get things to work right. Too close and you could scratch or chip the other end, too far and you would lose too much energy. It was a pain to use. Worse yet any dust or fingerprints on the exposed connectors meant a bad connection, and 50 micron dust is pretty common in most places. The newer MXC connector solves all of these problems to some extent starting with recessed contacts. Yes the fiber is not on the farthest point of the connector it is back in so it is very hard to touch. Genius! Better yet each contact has a lens on the end so instead of 50 micron connectors each one is effectively 180 microns so tolerances go way up and dust is less of a problem. The best part however is that the connections are non-contact so you don’t scratch or chip them when mating fibers, it just has to come close. These may not sound like much but little things like this are a massive step forward. Cost is also an issue, one that is usually solved through complexity reductions. An MTP connector has between 20-25 parts, MXC is at 8. Attention was also paid to ruggedness with a 45 pound pull strength on the new connectors, much better but not enough to stop a wayward but determined data center janitor’s broom handle. The last new feature is in the ClearCurve fiber itself, a much tighter bend radius. Older fibers had problems at about 38mm bend radii, Clearcurve is OK with 4mm. This may not sound like much but it allows you to route things on a motherboard without too much of a problem. Why would Intel want this feature? No clue, nope, none at all. The success or failure of MCX depends on one thing and it is by no means technical. Intel and Corning promise that the MXC connector will be a standard that will be “made commercially available to other manufacturers”. There are patents involved as you would expect and on the surface this stance sounds good. Intel did express that it should be an open standard but it is not one yet due to the immaturity of the spec and other paperwork challenges. MCX will live or die on Intel and Corning making it open, free, and without strings, something they intone they will do.